The lovable, sad-eyed, Basset Hound might be most recognizable to you as the mascot for Hush Puppy Shoes, but Basset Hounds are so much more than that. This breed is a marvel of genetics that work together to make it the perfect companion for game hunters on foot in the field. By and large, Basset Hounds are believed to be genetic mutations descended from the legendary St. Hubard's hounds; St. Hubard himself being no less than the patron saint of the hunt. Bassets, like many of today's hound breeds, can trace their origins back to France, where it was common to find both a tall, and a short version of each breed to serve different purposes in the hunt. In fact, the word Basset actually means low-set in French and Basset Hounds are the short-legged counterpart to the much taller Bloodhounds. Although you might not realize it, Basset Hounds are the perfect ground tracking and flushing machines. The Basset's dwarfed legs are one of its strongest assets, keeping it low to the ground in search of rabbits and other small game. With such short legs, this breed tends move at the perfect pace for human companions to keep up with on foot. The Basset's impossibly long ears serve a greater purpose than just being one of the most recognizable physical characteristics of the breed. As they drag along the brush, they actually help capture game scent, and funnel it toward the Basset's marvelous olfactory system in it's long muzzle. This gives them a great advantage in tracking potential game. The Basset's long tail is held erect and makes a good flag to help hunters keep track of their dogs through the brush; which is usually tall enough to conceal most of the body when these hounds are seriously on the trail. As previously mentioned, this breed is short on leg, and should be no taller than fourteen inches. The back should be longer than the dog is tall and individuals should carry very deep chests. Bassets are deceptively heavy for their body size, ranging about sixty pounds on average. Basset coats are short, smooth, and come in three basic color combinations, although the AKC breed standard says all hound colors are permissible. These dogs should be bathed as needed and care should be taken to wipe around their eyes on a daily basis. Loose jowls also mean there will be occasional drool to deal with, so keep a towel handy for that too. Nails should be kept trimmed unless dogs are allowed sufficient outdoor exercise to help wear them down. It's also a good idea to check those flowing ear flaps now and then for signs of damage. Bassets are a fairly congenial breed and enjoy being part of a family. They aren't especially territorial, so they normally get along well with other pets in the home. In fact, a single Basset will be will a bit lonesome without any companionship. Be aware though, these hounds do show a stubborn streak from time to time and behave quite independently when something particularly catches their interest. In some cases, Bassets have been known to catch a scent trail and take off following it, much to their owner's chagrin. Being one of the premier scent hounds, Bassets excel in tracking events and field trials, putting their natural talents to the test. Some individuals have also done well in obedience trials, but these dogs aren't really designed to handle hurdles. They do, however, perform the long down quite well and love to practice this particular exercise around the house! 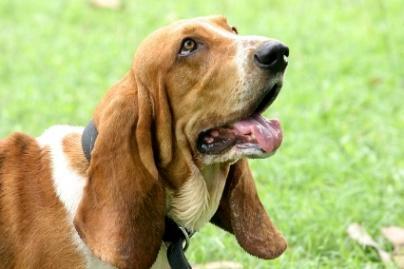 Basset Hounds are a hardy breed overall, but there are some genetic disorders present in the breed that prospective owners should be aware of. Will a Basset Fit Into Your Life? If you're looking for the next great agility dog, or a pet who will run alongside of you while you bike, a Basset is not a good fit for your lifestyle. If, on the other hand, you want a loyal, loving companion who still has a mind of its own and speed isn't an issue, a Basset can make a wonderful companion. If you also happen to enjoy a bit of outdoor sporting, then the wonderful Basset Hound just might be the perfect fit. This breed is at its best when it is allowed to do what nature has designed it to do.